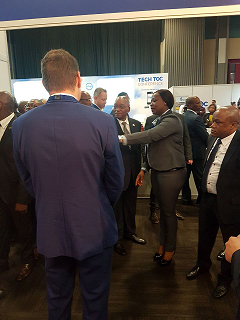 BLT SA – specialists in the supply and support of an extensive range of container and bulk handling port equipment – participated at the TOC Africa 2017 conference, held recently in Durban at the ICC. “This world class terminal operations conference, which focused on port and terminal technology and operations, was well supported by port equipment and technology operators and suppliers,” says Ken Mouritzen, BLT SA. “This was the perfect forum for global collaboration and for local, regional and international suppliers to showcase advanced solutions to terminal operators and port authorities. This year’s conference highlighted the importance of the maritime container supply chain in improving trade flows across the African continent. 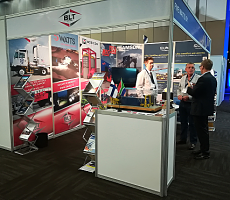 BLT SA – specialists in the supply and support of an extensive range of container handling and related port equipment – participated at the TOC Africa 2017 conference, held in Durban at the ICC. “As key players in port handling equipment, the BLT team is encouraged about our country’s substantial investment in expanding the capacity of major commercial ports, to support the projected increases of cargo volume. Highlights of the two day event included President Jacob Zuma’s visit to the BLT stand and a presentation by 5 Watts about the importance of safety lights in a port environment. BLT SA’s extensive range of container and bulk handling port equipment encompasses Mobicon straddle carriers, Taylor empty and loaded container handlers and reach stackers, as well as Meclift variable reach trucks for swift and safe container stuffing and handling. Capacity terminal tractors can be customised for specific handling tasks required. The company is also the exclusive distributor in Africa for the Samson range of bulk handling equipment, which includes material and boom feeders for loading and high capacity stockpiling, link conveyors and grab hoppers, as well as mobile shiploaders. BLT also distributes MDS trommel screens and apron feeders for mineral processing and recycling applications. BLT supports its extensive range of new and reconditioned machines with a rental option and also offers a maintenance programme designed for optimum performance and extended service life of every machine. The company works closely with customers to ensure all equipment meets exact performance and safety requirements. A technical advisory and original spare parts service is also offered throughout Africa.